H x W: 19 in. / 30 in. 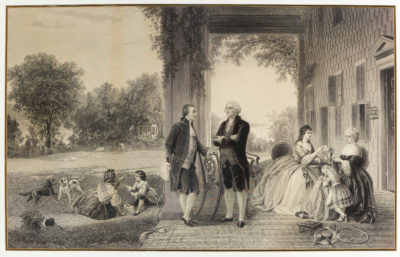 This print, of unknown origin, depicts George Washington and Thomas Jefferson meeting at what is most likely Mount Vernon, George Washington’s home outside of Washington, D.C. Given the serene, light-hearted atmosphere the work conveys—a young boy plays with a housemaid as two dogs watch on, while his sister leans on her mother’s lap as she polishes a ring, and Washington and Jefferson seem engaged in pleasant, leisure conversation—it can be surmised that this is a portrait of the two men in post-Revolution America.